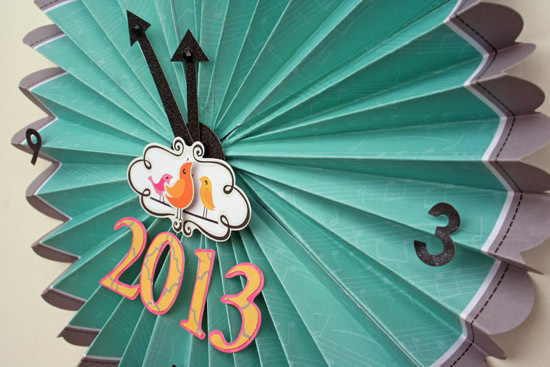 Ready to ring in the new year? 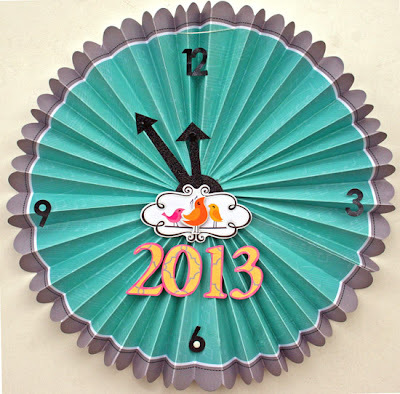 Today I have a few New Years Eve rink-e-dinks to share with you using My Little Shoebox's Keepsake collection. I chose this collection because of its great colors and prints. Happy Thursday, MLS friends! 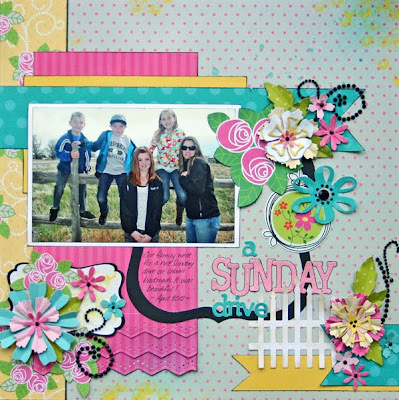 It's Robyn Schaub, here to share a layout I created with the Keepsake collection from My Little Shoebox. I'm always a fan of bright colors, and the Keepsake collection has some of my favorites: yellows, pinks and a beautiful shade of turquoise. I wanted to find a way to mix all the lovely colors and patterns without making the layout too busy. So I decided to cut some small strips of my favorite papers and use them -- in small doses -- along the bottom half of the layout. I cut all the strips to an equal width so they would have a balanced feel, even though there were competing patterns and colors. Then I handcut some matching frames from the Picture Perfect paper to layer on top, using foam tape to give them a little dimension from the page. To finish, I added cardstock alphabet stickers for the title and a few of the bird stickers. 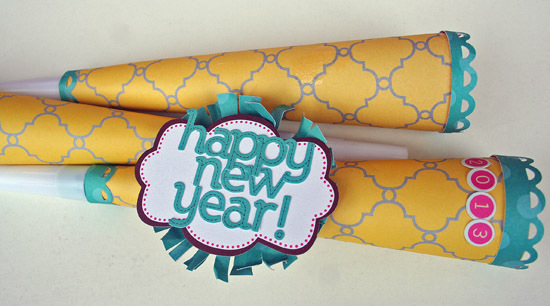 The gray polka dot paper in the background helps to ground all the patterns and provides a perfect mat for the photo. Don't be afraid to play with patterns and color on your next layout. You'll be amazed at what you can create! Hello My Little Shoebox fans! 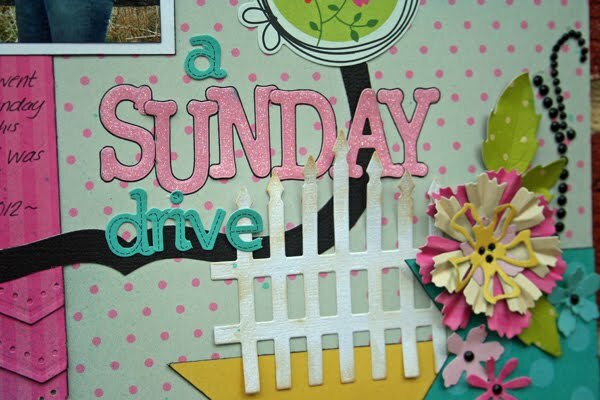 Liz here to share with you a few layouts I made with My Little Shoebox's adorable Keepsake collection. I love that the colors and prints are very versatile. I was able to make a girly page and a masculine page of my husband. Hi, everyone!! Carol here today. 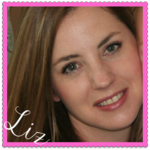 I want to share 4 projects with you using the Keepsake Collection. Keepsake is one of my favourite collection as they are bright and cheery!! I love the frames and flowers!! Love fussy cutting them out and layering them. I love using white cardstock as the base for my projects as it really brings out the bright and cheery look of My Little Shoebox papers. For my second card, I created a pocket and insert a piece of frame tag inside. Normally I will see what elements are in each collection and will match my theme accordingly. 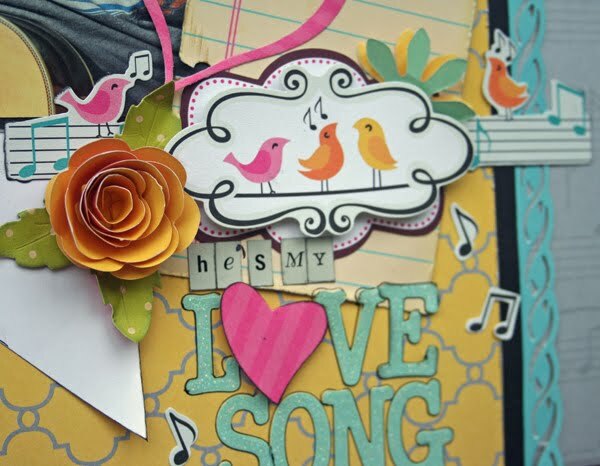 So for Keepsake, I used birds, flowers, frames and music as my themes. For the next 2 layouts, I made one for my son and one for my daughter. Being a masking/misting type of scrapper, I misted the background for both layouts. I also enjoyed cutting out the small flowers from the papers and layering and folding them to make them more dimensional. For the title, I popped the alpha stickers with foam strips to make them stand out. The idea to link up the frames and photos for this layout is taken from the photo of my son playing with his "links". Hence the title too. Yellow mist used for this layout is to depict the color of the sun and I inked the edges of the cloud diecuts with distress ink. I layered the papers and photos with black cardstock. By mixing the different flower cutouts and layering them, dimension is being created and it made the page looks more interesting. I hope you will be inspired by my projects. Do come back each day to view our talented design team's projects!! Thanks for viewing! 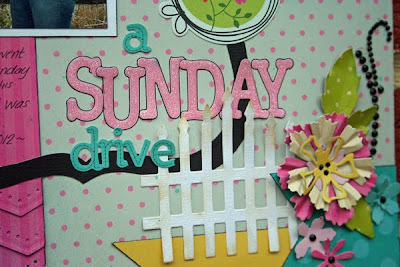 Hi it's Jenifer here with you today to share a couple canvases and a couple cards with you. 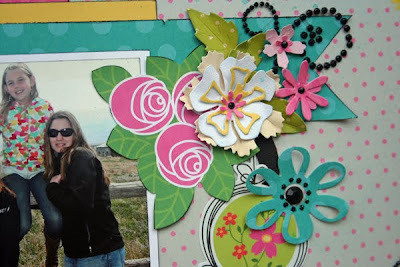 This month I had so much fun using the Keepsake collection. It was so hard picking out just a few of my favorite pieces so I think I used every single one of them. First up are the canvases. These canvases measure 6x6 and I just made them out of scraps of wood and some canvas that I had laying around. I then decorated them with papers, ribbons and paints. I had so much fun making these and my Daughter has already claimed them for her room :) They look like mini hanging quilts and I just love them. Here is a close up of Create. Here is a close up of Inspire. Supplies: All paper from the Keepsake collection. Ribbon and Twine from May Arts. Adhesive from Therm O Web. Hello everyone, Beckie here today and I'd like to share with you my projects that I have made using the Keepsake collection. I really do love the music notes and little birds which feature on some of the papers. I love the mix of colours too, so bright and cheery! We have this Musical Birthday Hat which is passed around the family for them to wear on their special day .... this time it was my MIL's turn and the colours matched perfectly with the Keepsake papers!! I cut out the centre of the scallop circle so that the background paper could be seen. I used a small section of the cut out again at the base of the circle but have saved the rest for some cards. The scalloped border, which is on the 3D flower sheet, is great for adding some texture to the layout, I added some adhesive gems in the centre of each of the scallops. For the next project I decided to use the scallop circle differently. This time I cut it in to equal sections, just as you would with a pizza. I decorated each of the sections up before I glued them together. I used the journal tags on the Keepsake - Simple Treasures as background pieces for the chipboard letters which are covered in the Garden Delight paper and a thin layer of glitter. You can make the banner as long as you wish, this one helped to celebrate my daugthers birthday. Hi, it’s Monique, with a layout about my daughter using the Keepsake collection. When I saw the colors of this collection I knew exactly which photo I was going to use for my page. Normally I tend to use red & pink colors for my layouts, but lately I find myself reaching for yellow more and more and this combination with blue & grey I absolutely adore! One of my favorite techniques is layering. I love to layer papers with different designs and colors and then stitch them all together, as sewing on my projects is almost a “must” for me. For this layout I used a sheet of cardstock as my base and layered 3 Keepsake sheets on top of it (“Razzleberry & Chiffon”, ”Garden Delight” and “Sound of Music”). The photo is placed on a matt of yet another sheet of the Keepsake line: “Windowview”. Behind the photo I placed two pieces of patterned paper, which were machine stitched first. I then added the title on top using two different sets of alphabet stickers (Sprinkle Glaze and Mini Alphabet Stickers). For the next step I used stamps from an older collection of My Little Shoebox: "Sew Cute" and stamped around the photo. To create the epoxy banners I used the Pennant tool from "Epiphany Crafts". To adhere the banners to the page I used 3D Foam Squares to raise them a bit to create dimension. I finished my page by adding cardstock stickers, die cuts, twine, flowers, a swirl, liquid pearls and some ribbon. And that’s it! Hope you like it! What I love about the Keepsake collection is that all the papers are double sided. Because of that there are so many fabulous designs to choose from for your project and they all match so perfectly! I would love to see what you create using this line! Please share your projects on our Facebook page and I'll make sure to stop by your blogs to have a look! Other supplies: Cardstock: Core’dinations; Ribbon: Webster’s; Epoxy shapes: Epiphany Crafts Bubble Caps Pennant 25; Flowers: Petaloo; Pearl Swirl: ZVA Creative; Twine: Divine Twine; Liquid Pearls: Perlen Pen Viva; Adhesive: Tacky Tape, Scrapbook Adhesives, Scotch. Hello MLS fans. We hope you had a great weekend! We're kicking off another week of inspiration here on the MLS blog with some fantastic card creations by a few of our design team members. We hope you'll identify with one or all of their styles and be inspired to create a card for someone special today! Other: Spellbinder die, Cuttlebug embossing folder, American Craft ribbon, Sentiment from Unity Stamp Co.
Other: Martha Stewart punch, American crafts ribbon, Spellbinders die, Stickles, Perfect Pearls. That's it for Monday. Tomorrow we'll have another great Tuesday Tutorial for you and a challenge where you can win some My Little Shoebox goodies later this week! Hello MLS fans! You might remember last month that we gave designer Mandy Starner the Collection kit challenge using our Keepsake collection. Well for this month we gave the same challenge to designer Nicole Wragge and boy did she make the most of the Keepsake collection kit. Here's what she created. I just couldn't wait to get home and start playing! The Collection Kits consist of one of each paper within the collection, one die cut and one card stock sticker sheet. And the challenge was make as many beautiful things as you can using the Collection Kit! Throughout this creating process there were a couple tips that really helped me get the most out of my paper. First step was to trim the papers down to 12 x 12, removing the little 1/4 inch tab at the top. Instead of throwing away that little tab, I saved them and used them throughout the projects as journalling or stripes! Those little strips of paper could add a pop of color in a pinch! Layering different papers together adds such a beautiful effect to layouts, and I tend to lay everything out on my paper until I get things just the way I want it. But before I started adhering pieces together I used my trimmer to take a piece out of the bottom 12 x 12 to save it for later. For example, on the SCRAPPY TIME layout I saved a 5.5 x.5.5 inch piece of the card stock paper and used it on other projects. 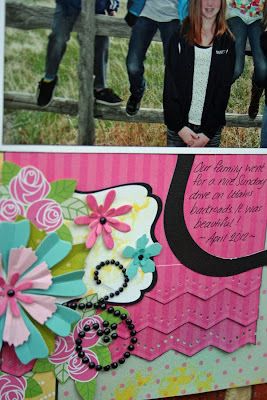 It seems like February is birthday month so I was excited to make a birthday card using the new Keepsake Collection. The rolly flower was altered using Viva Pink Glimmer Mist and then I used a pretty craft pearl for the center. The leaves were trimmed from the pretty rose card stock sticker and then distressed with some Vintage Photo Distress Ink. The roses in this collection have such soft feel to them, so very pretty! Using Diamond Stickles made them glitter a little and then using the UNITY "hello" STAMP from the Pretty Little Things Collection added the sentiment to this card. The delicate pink bakers twine looped around the 4 x 4 card added nice dimension without much bulk. This layout was such fun to create! With my sister's recent engagement and her color choice of yellow for the wedding colors - the GARDEN DELIGHT paper was destined to be on this layout! I used 10 of the flowers on the die cut sheet - one for each year that they have been together - and then dressed them up with Stickles, buttons and Glossy Accents. I could tell where my inspiration came for this layout - I had been doing "square" homework with my daughter and that shape carried over to my layout! These photos of my dear friends were taken a few years ago at a scrapbook retreat in Arizona and we had such fun together! The pretty CHIFFON mini alphas were such a bright and happy yellow against the pink card stock. I LOVED MAKING THIS ALBUM! Using all the pictures from CHA, I trimmed them down to a 4 x4 to fit in the 7Gypsies Album and then had a ball embellishing each page! Ribbons, black & white polka dot SMASH tape and Stickles really brought out the beauty of the music notes, the darling birdies and the versatile journal tags! The last picture is what I have left over... which means more crafting creations using KEEPSAKE!!! We hope you've been inspired by Nicole's tips! Hello MLS fans. We're excited about our new collection kits that we debuted at Winter CHA. The collection packs feature one of all 6 patterned papers, 2 double sided solid cardstock sheets, cardstock sticker sheet, die cut and 3D flower die cut. 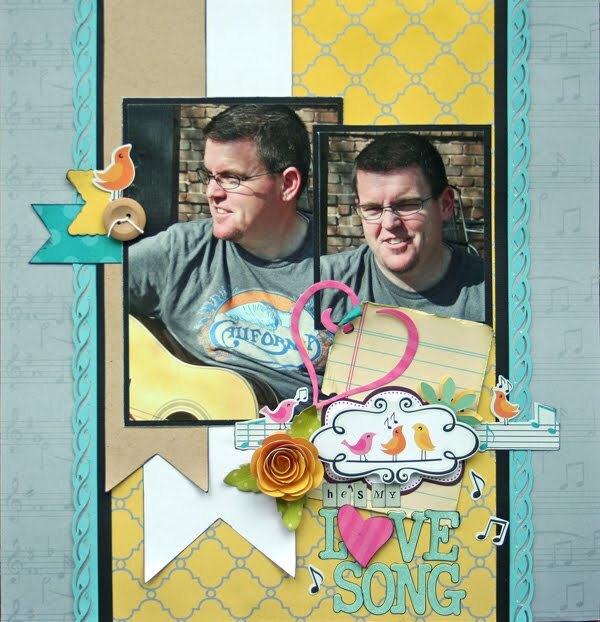 What's even better is that you can easily create 3 beautiful layouts and more with just one kit! Today we've given that challenge to our design team member Mandy Starner. Mandy used our Keepsake Collection kit to create with for this challenge. Here's what she was able to create. 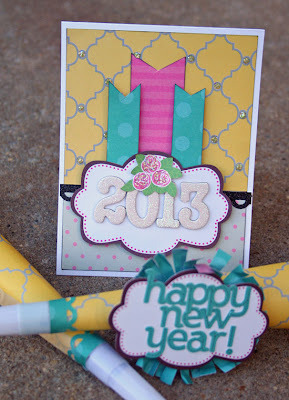 Mandie was also able to create 2 cards with the left over scraps. We hope these projects inspire you to pick up one of our new collection kits the next time you visit your local scrapbook store. If you enjoy shopping online, our new collections are also now available online at Two Peas in a Bucket.